Congratulations to Lakeshore Learning as they were recently awarded four Teachers’ Choice honors from Learning® Magazine! Over the years, Lakeshore Learning has been one of my favorite resources for supplemental educational products such as learning games, arts and crafts supplies, toys, educational software and children’s books. I was thrilled to learn that Lakeshore Learning earned the four awards for 2014 for the following exceptional educational products for the home and classroom i.e. Math Plinko, Launch It! Language Games, Let’s Learn Language! Interactive Game Shows and the Pop & Add to 20 Game. My children are using two of these award winning educational products in our homeschool classes and I agree with Learning® Magazine that these products are excellent for young learners. My kindergartner and first grader are learning to read and the Let’s Learn Language! Interactive Game Shows series is one of our favorite supplemental resources. This complete set includes three CD-ROM games (for Mac/Win) or it is available as an instant download and includes Let’s Learn Phonics!, Let’s Learn Vocabulary! and Let’s Learn Early Reading Skills! Creatively developed in an exciting game show format, my children forget that this is a learning activity since it is so much fun. 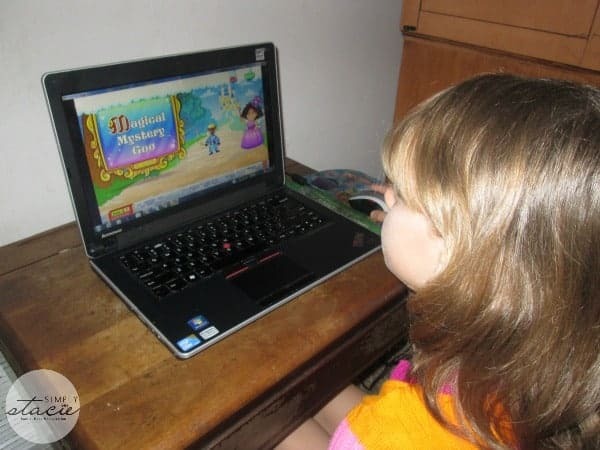 In fact, they frequently ask to play these games on a regular basis during school and even during their free time on the computer. They especially love when the winner is taken by the fairy host to the castle so they can choose a “magical prize” such as an egg that hatches into a baby dragon. I appreciate that these also include free printable assessments, score reports that I can use in our annual homeschooling portfolio, audio support and additional bonus features. The Let’s Learn Interactive Game Shows complete series is packed with learning activities and is very attractively priced at $39.99 for a single license CD-ROM, $39.99, $39.99 for a single license instant download or $95 for a class license. 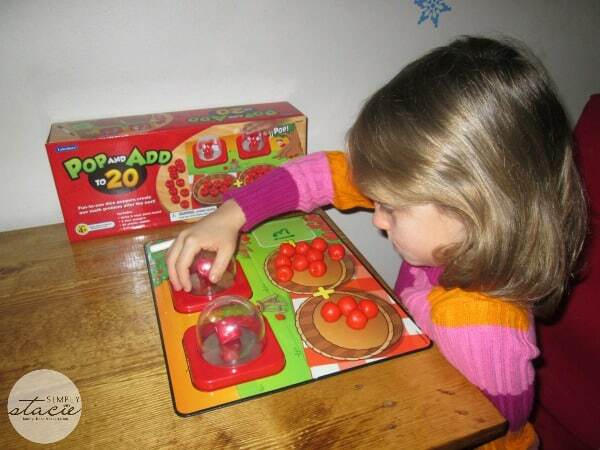 My younger children also love the Pop & Add to 20 Game (SRP $26.99) which helps kids practice valuable addition skills. This wonderful hands-on math activity game is a fun way for children to make math more exciting by allowing them to use the dice poppers to create addition problems with a sum up to 20. Jacob and Hannah love to play by pressing each of the dice poppers and then they write both numbers on the dry erase game board. 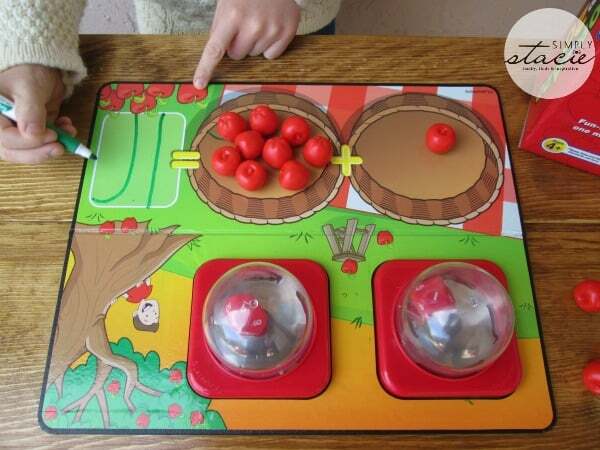 Then they place the coordinating number of pretend apples on the board and write the correct answer in the designated area. After simply wiping the game board clean, they are then ready to do a new problem. While it is designed for addition problems we also modify it a bit by using our dry erase marker to mark through the plus sign and then do subtraction problems too. Overall, this is an excellent learning game……I am not surprised that it is an award winner! You are invited to visit Lakeshore Learning to view all of the Teacher’s Choice award winning products and browse the entire educational product line. Lakeshore Learning is not just for teachers but a wonderful resource for parents who are looking to provide their child(ren) with the highest quality learning toys, books, games and computer programs for home practice. I would like the real working cash register. I like the Color Match Learning Garden. Thanks for the giveaway! It’s a little above my budget, but I would lovelovelove to get the Reading & Writing Activity Stations (Complete Set) for my 2nd grader. He is having a very hard time learning to read and write and a set like this would be fabulous for him! And the best part is that it is for up to 4 kids, so we could share it with his special reading group and donate it to his school when he was finished with it. I like the Real-Working Cash Register. The magna-tiles look like a lot of fun and educational too. Thanks for the chance to win. I would like a set of Magna-Tiles to play with — for myself. There are sturdy play trays available.